This machine, invented by Charles Bennett, first appeared on the market as the Junior in 1907. The Junior had no paper table and used an ink roller in stead of a ribbon. The keys on the miniature keyboard were fitted extremely close together. Pressing the top key in a row would bring down the ones underneath at the same time. Note the odd central place for the space key. 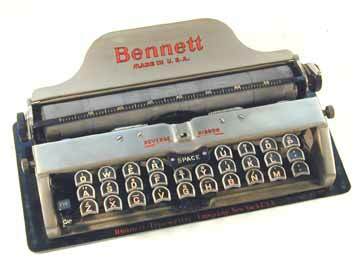 The earliest patent on the Bennett goes back to 1901. 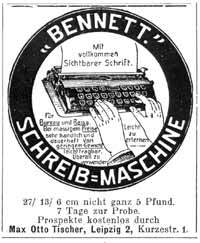 However, in 1934 an index version of the Bennett was introduced in Germany with the name Carissima (see linear index typewriters). See the book TYPEWRITER, page 197 for more details.